FEATURED IMAGE | Source: Teamblind Inc.
Start small. Break rules. Get lucky. June 13th 2016. You work at Microsoft and on the way to work you read on Forbes that your fearless leader dropped $26.2 billion dollars in acquiring LinkedIn. Coworkers bomb your Windows phone with a collective “wtf?” as everyone tries to make sense of all this. What if you worked at LinkedIn? Shares hit puberty, talks of mass exodus fill the office. And what about Jeff? It’s confusing times really. All eyes were on Microsoft’s acquisition of LinkedIn. They paid a 50% premium to Friday’s close in their biggest deal ever. This came as a surprise as LinkedIn to many, was so different from Microsoft. Frankly, some of us weren’t over the Nokia fiasco either. The truth is, rumors of this buyout circled our anonymous workplace community app Blind days before it was announced publicly. Just that weekend alone, we saw 1 out of 10 employees at both Microsoft and LinkedIn visit Blind. Yes. We got lucky. But, startups get lucky all the time. In fact, ‘luck’ is so important, Steward Butterfield, CEO of Slack, asks all candidates about ‘their story’ to assess how much of an individual’s career success can be attributed to luck. But luck doesn’t happen to those who just sit around and wait. Our formula at Blind is to stay laser-focused on 1 milestone, consume unhealthy amounts of coffee, and work with a healthy disregard for rules and regulations. Here’s how we got started. June 2015. We launched our closed beta for Amazon employees huddled in a rundown motel near Amazon’s Downtown Seattle Headquarters. With our phones tethering data to our MacBooks, we flipped on the switch at around 11 pm and messaged several dozen of our Amazon friends Blind was now live. In the coming weeks, we managed to garnish a few hundred users —by social app standards, you can probably round that down to zero. However, our goal from the very beginning was to get 200 users by the end of the first week. In an anonymous environment having 100 users who can relate with each other is better than having tens of thousands who have nothing in common. Besides, we did a pilot at LinkedIn down in Mountain View, CA two months prior. I can’t disclose numbers, but I remember being able to count our DAU (daily active user) at LinkedIn on my left hand. We chose not to focus too much on numbers. Too many anonymous messaging apps doing very similar things as us have come and gone over the years. The secret sauce is in building a community where users feel identity and relevance in our content. Even the flakiest entitled techies of tomorrow will return to an app that covers those three elements. A community app needs identity and relevance. How do you do that with an anonymous backdrop…? We were back in San Francisco, bootstrapping out of the best cafes the city has to offer (best means best wi-fi in this case). It wasn’t long before we agreed that building a super exclusive anonymous community app was going to require some guerrilla warfare behind enemy lines. We packed light, bought umbrellas, flew to Seattle, got an apartment next to Amazon HQ and started pitching Blind to everyone we can come across. The goal was simple. We wanted to find champions. People who believed in our vision of bringing more honest conversations into the workplace. A community that was regulated by the users, where what was said was more important than who had said it, not some tool that HR wanted people to use. We met an ex-Microsoft employee on a networking app. I pitched our idea and I saw his eyes light up. There was a blog called Mini Microsoft which was the center of all Microsoft rumors and layoff at the height of Ballmer’s reign. The webmaster known only as “Mini” has stopped managing the blog. Some say he/she was fired. Some say Mini was bought out, but what’s important was that every Microsoftie knew about this sacred space. And that audience was exactly who we needed as our first group of users. With that, my partner and I started reaching out to every Microsoft employee we could find and eventually landed several conversations that went something like this. Me: What would you ask if you were in an anonymous app full of your coworkers? Microsoft employee: I’m not sure, we’re pretty open with each other. Me: Do you feel like you can talk honestly in the work place? Microsoft employee: Yeah for the most part. Me: Is there an anonymous community at Microsoft? And did this all over Microsoft campus. Among other things of course. For us, we only thought about the metrics that were important to us. Penetration by industry, by company and user retention/activity. Either way, while prepping for another round, this time with some help from friends who worked at Microsoft, I got this friendly text message. 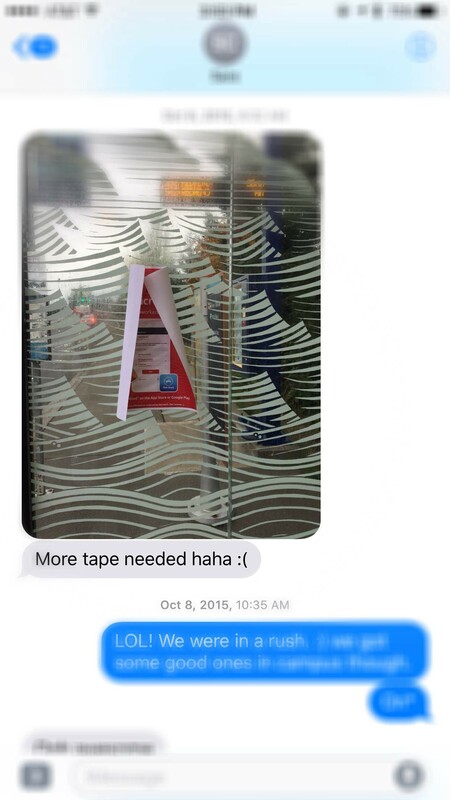 Moral of the story: don’t be cheap with tape. In the next two days, we doubled our users and started dabbling in Facebook ads. In a few short weeks, Microsoft users began emailing us inquiring about Blind. We even ended up meeting a few of them for coffee. You know who you are. Some Microsoft users thought this app was created by ex-Microsoft employees. Proof that being local to your market is key. We only had several hundred users, but our retention was exceptionally strong. DAU/MAU was hovering in the 60%s. Daily activity was something like 17 minutes with an average of 2.9 visits per week per user. We launched an inter-company channel called “lounge” so now Microsoft and Amazon users can talk to each other. Things were just about to get interesting. We found out about a very similar app that was created in-house at Microsoft while having lunch with some friends there. No Alex. It’s not Yammer. It’s literally exactly what you guys are working on. The app was called ‘Forum’. It was designed with a clear purpose of fostering more conversations in the workplace (just like us) and featured a Q&A section that held open sessions with specific groups like Microsoft benefits and had karma-like points. It was beautiful. They had up-votes and down-votes too (which I really wanted at that time). Ironically, within a few short weeks users on Forum began talking about Blind. Users who were on both apps would post the exact same content to see which community responded better. It wasn’t long before forum was discontinued. I like to think that the fact that we were not affiliated with Microsoft was a big motivation for users to switch over. Ultimately, having an internal app at Microsoft ended up fueling our growth, even if every user had to use their work email on a third party app to verify their employment to get into Blind. Our focus around Community and Identity has proven successful. 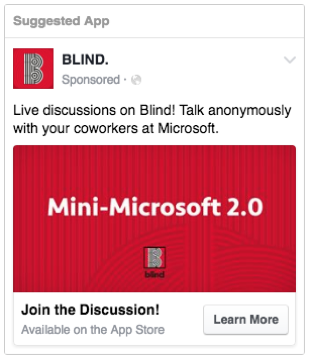 What we’ve seen at Blind is very different than how other social apps behave. Usually after the first jolt of users, if the content and community on Blind resonate with our users, growth happens very slow and steadily. 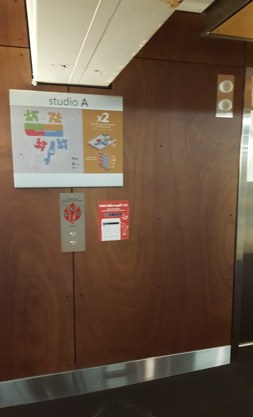 Users at Microsoft have grown organically after our early guerrilla marketing efforts. When Microsoft acquired LinkedIn, a 10th of all Microsoft and LinkedIn employees in the US logged into Blind. We really felt like we created genuine value for our users that day. 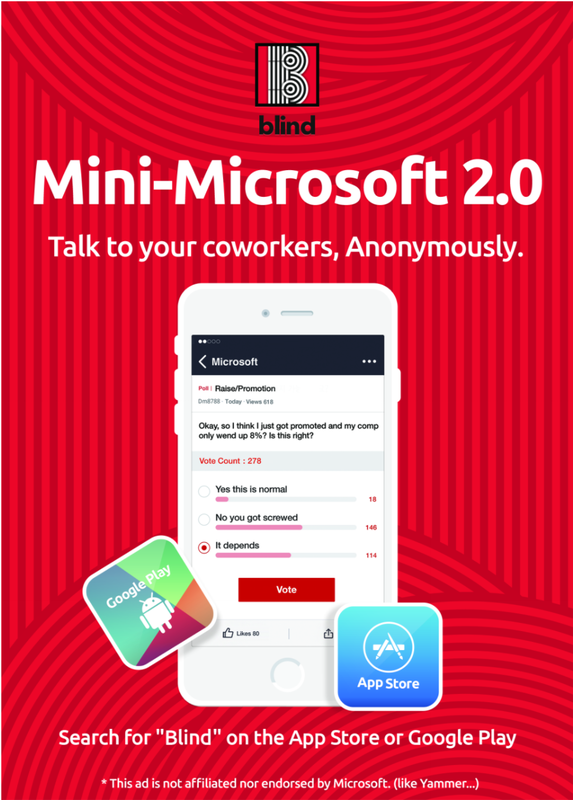 Today, Microsoft employees can find major company-wide news, layoffs, rumors, career advice, dating advice, and pretty much anything on Blind. It’s community regulated. Which means all content that isn’t flagged down by the users are fair game. Users can flip over to our inter-company channel and engage in open dialogue with verified employees from other top-tier tech companies. Users can also benchmark offers, work perks, discuss recent tech news, politics, dating. It’s all there. We’ve seen recent success at Facebook, Uber, Yahoo (with their layoff announcements), and more. These are the groups that lead our community. We can confidently say that we have about 1 in 5 of every LinkedIn employee on our app. Probably 1 in 7 of all Uber employees as well. There is quite a big presence from Google, Facebook, Oracle, and even Airbnb. There is a lot of room for improvements in our professional lives and we see examples of that on Blind every day. 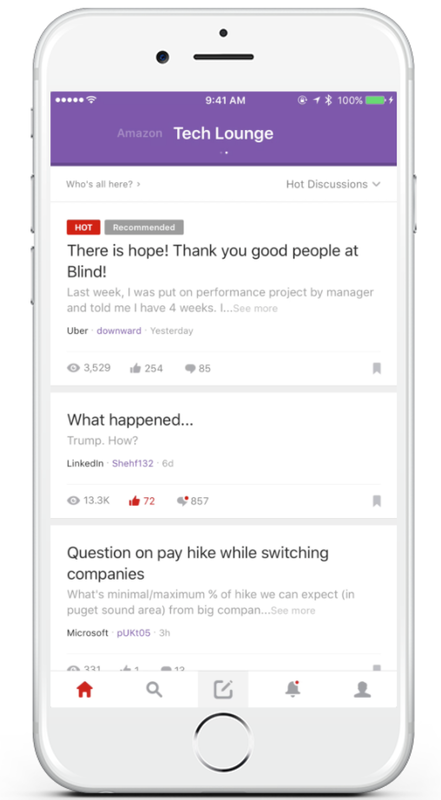 TeamBlind is based in San Francisco and builds exclusive anonymous mobile communities for the workplace. Blind is available in the App Store and Google Play and is currently exclusive to employees at top 100 tech companies.